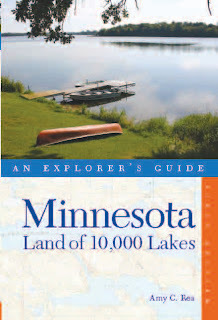 Today's book recommendation is from a Minnesota blogger and writer (you know how I love MN). Check out her blog, A Closer Look at Flyover Land ! Recommended by: AmyCRea who says, "Hee. I'm going to give my own book as a travel gift." And to this we all say "AMEN!" So, now your Twitter list continues to grow. And this is book #8! Are you done with your shopping yet? ?